Double wall -- double protection. A NEW range of double-wall plate heat exchangers is now produced in Australia by Teralba Industries , under license from Paul Mueller Co, based in USA. 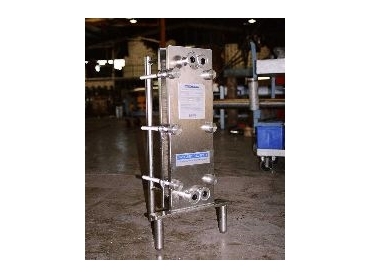 Mueller's double-wall Accu-Therm heat exchanger is constructed with two identical plates nested together. Each of these double-wall pairs are fully welded at the port locations, creating a two-layer heat transfer wall. These pairs are then assembled into the heat exchanger as a normal single plate would be installed. In the unlikely event that your product might penetrate through one of the plates, the fluid exits between the two plates at the edge of the unit. This allows for immediate visual monitoring of the unit as well as providing maximum protection available from mixing of the products. As with every standard Accu-Therm design, any gasket failure also permits the leaking fluid to be safely diverted to the edge of the plate pair. Again, this allows for immediate detection and security that the fluids are not mixing. The feature that makes the Accu-Therm heat exchanger so useful - External Leak Protection - can provide double protection with the double-wall construction. Any hole in the plate surface allows the product to leak to the edge of the plate pair for immediate visual detection.